I was born in 1988, and I am from Kiriat Bialik. 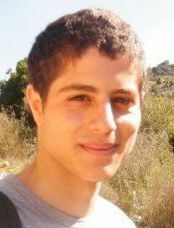 During high-school, I participated in "Archimedes project", in the faculty of chemistry at the Technion, which is a program intended for high-school students, in which undergraduate courses (mainly in chemistry) are given. I consider it my first exposure to science. Later on, I took part in two international chemistry competitions, held in South Korea and Russia, and even won a medal once. In the army, I served in a technological unit, which showed me the more practical sides of science, mostly computers and electrical engineering. During my service, I also read books on physics and mathematics, which revealed a whole new world to me. The result was a "positive" confusion as to what I was going to study; a confusion which I believe the program can handle quite easily. Currently, I study a double degree in physics and computer science, but I hope that with the help of the program, other aspects of science won't be neglected. BTW, I wrote "about myself" only in relation to studies. Of course, this is only one aspect of me. Hobbies and other activities: Swimming, jogging, playing basketball, playing tennis, travelling, reading, playing the piano, singing, doing nothing.